One morning Mr Monkey drove past his local Sainsburys, and couldn't help noticing a temporary fence around a small hole in the ground. It wasn't until July 14th that Mr Monkey managed to make Mr Rik go and investigate the hole. Mr Monkey immediately spotted that someone had put some large bolts and a lot of concrete into the hole. He also noticed a sign which told him that something called HAZEL GROVE PUBLIC ART was being built there, that it had started on June 18th and that it would take four weeks. 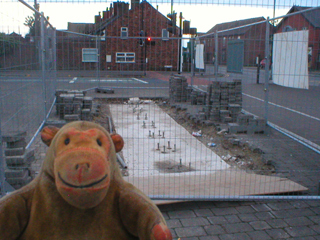 Mr Monkey decided he should visit the hole in the ground frequently, in the hope of seeing the public art develop. Three days later, on the 17th, he looked again and found that a number of tall metal stalky things had been fixed onto the bolt units. The fence was still up, and the paving blocks were still neatly stacked up around the sculpture. Four days later, on the 21st, Mr Monkey went to look at the site again, and found that all the paving had been put back, and the fencing had gone. The sculpture was apparently finished. Mr Monkey was rather peeved to see that that was no indication of what the sculpture was called, or who made it. He believes that artists should think of proper names for their work (Untitled doesn't really count as a name) and that the name of the sculpture and of the artist ought to be clearly visible on a small sign nearby. 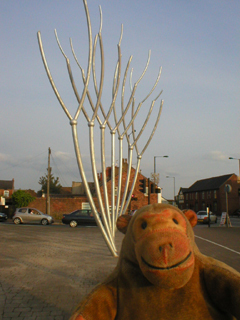 After a bit of searching online, Mr Monkey did find out that the sculptor was Adrian Moakes, who works in Manchester and also designed the University Challenge trophy. 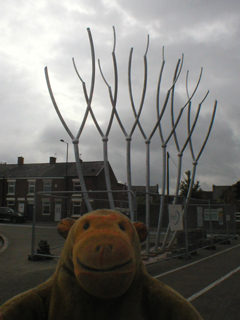 Mr Monkey also worked out that the sculpture represents a grove of hazel trees, and that it looks a lot better viewed on foot and end on than it does from a car on the A6.